I set my alarm so that I could be up for hostel breakfast. It was a standard HI hostel breakfast which is actually pretty good. A large range of spreads, some cold meats and cheese, sometimes boiled eggs, coffee, tea, bread, juice and then these other things I don’t touch like tinned prawns and salmon pieces. I guess it is good and it is complementary which only means you have prepaid for it which means I feel like I have to get up for it even if I don’t want to. They usually make it finish at 9:30 as well and sometimes I want to stay in bed longer than the 9:00 which would be the latest I would get up for it. Anyway, I got up for it. I didn’t want to waste much time in the morning anyway. When I was fed and showered, I went out to the shops to get some food. It wasn’t that far but it was a nice walk. I got to see some of the surroundings and actually enjoy them opposed to when I arrived the day before where all I wanted to do was check in. The town was set on a lake surrounded by mountains, rocks and awesome. It was the same story I have been trying to tell for the last week. I seriously have run out of words. There is just nothing else I can say to emphasise the stunningness of Norwegian Fjords and the whole west coast. I even have to make up words like ‘stunningness’. Ok, so I went to the shop, did my thing, and walked back. I dropped off all my food (including labelling it and putting it away in non-free-food areas) and then headed out again to the bus stop to catch my bus to Nordkapp. After having to ask a couple of people which of the bus stops I needed, which I wasn’t expecting as the town has only a couple of hundred permanent residents and I was on the outskirts, it seems a little strange that they have so many different bus stops in the same place. Anyway, I got mine. The bus arrived, I paid my fair and I sat towards the front. I was on a large coach with 5 others I think. Two of them were the Asian couple that I had arrived with the night before. They had walked half an hour into town and caught the bus from there. The bus ride was really good as well. It had left at 11:15 from my stop which meant I got good light the whole way. There was just white everywhere. And if it wasn’t white, it was giant boulders or frozen waterfalls on the side of small cliffs. The first half of the trip was through fjords but then we climbed up the side of one and came out on top of them all. At the top, it was very close to a plateau. Just a large sheet of white blanketing everything you could see. Every now and then we would come close to the edge of one part and you could try and look down to the bottom of the mountains. The bus trip took about 45 minutes. 45 minutes of wow. We then arrived at what s kind of the Nordkapp discovery centre I guess is what it might be called. I walked around outside the building for a bit, taking photos of the midday sun which was barely anything on the horizon. I then walked over to one edge to have a look at one of the other points which can lay claim to the most northern point of Europe. I forgot to mention that the whole point of this trip up there was that Nordkapp can claim to be the most northern point of Europe. There are a few that can. There is another spot that can claim most northern point in continental Europe. 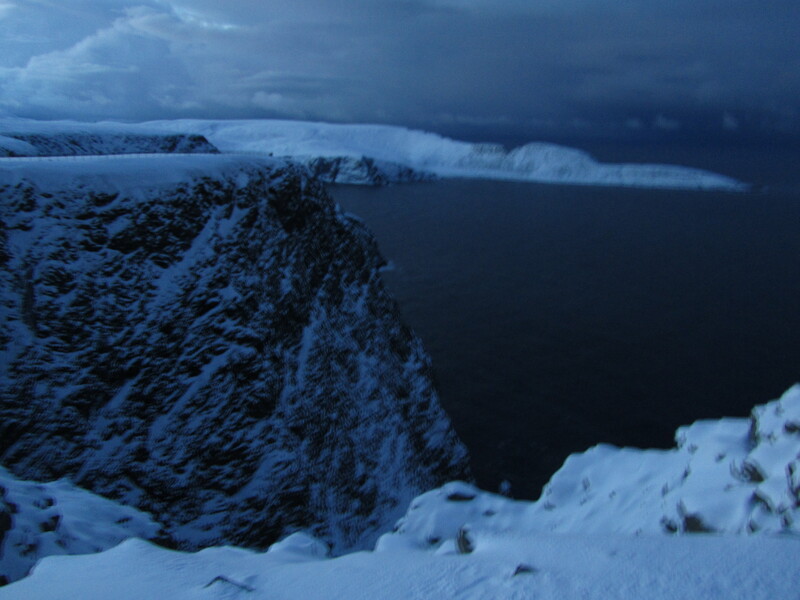 Nordkapp is technically an island but is the most northern point accessible by cars and the bit I was looking at was also technically on an island and a little further north. In summer you can walk there but not in winter. There is another place that claims the most northern point of Europe and that is the Svalbard islands which is part of Norway and 500km’s north of Nordkapp. 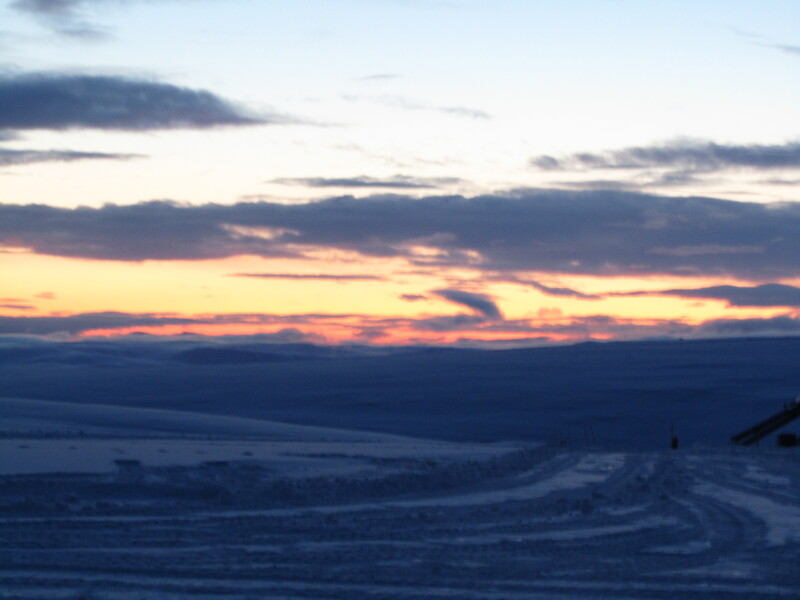 About halfway between Nordkapp and the North pole. So basically I was doing the best I could with what I had. When I had had a bit of a look around, I walked back over to the building. As I approached it, two guys next to a car called me over. They were from the Netherlands and had driven in 3 days all the way up to Nordkapp. I don’t know how far that is exactly but I do know that it was one hell of an achievement. After I took photos for them, I went into the building. It is a large place with different stuff inside. The stuff you had to pay to see so I decided to not do that. Instead I went out the other side of the building where you get to where all of the photos get taken. This part is just a little further north than where I was before. They have a giant globe sculpture out there. Plus, you are standing on cliffs 200 metres high. Nearly forgot to mention that bit. You stand above the ocean and bellow you is rocks and the sea crashing on them. Not that you can hear it, or even see it that clearly. It is too far away. But looking out, you can’t see a thing other than more ocean. It is no wonder that people thought the earth had an end to it. Right at that moment, I thought it had an end. I thought I was at it. Only because of Google maps did I know that the only thing between me and the point that this flat world pivoted on, was some islands and 1000 kilometres of ocean. Maybe some ice too. At that point I realised something that was pretty special. 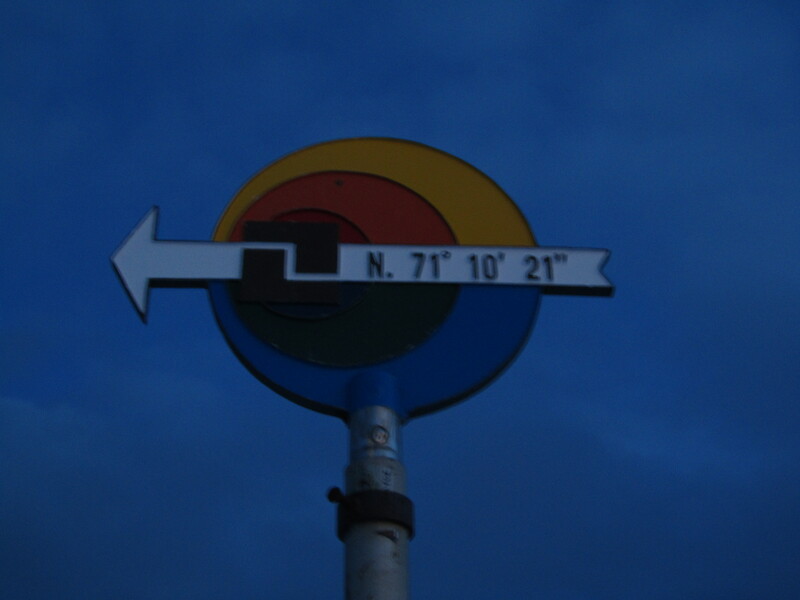 I had been to Dunedin as the most southern point and Nordkapp, being my most northern one. A total of 116 degrees of the Earth. That is 64% of the distance possible. Just under two thirds of the world. And that is without calculating the fact that it isn’t a direct north south line. I went back out the front where the bus was. I had seen a sign saying there was some kind of art sculpture outside there and I wanted to find it. It was basically pitch black by this point but I found it just fine. Looked at it. Photoed it. Walked away. It’s a good thing I had my own thoughts to entertain me. The other Jacob that I like to talk to. When it was time to leave, we got on the bus and the driver asked how it was and if we enjoyed the movie about Nordkapp and the Arctic. I said that they wanted to charge us to watch it and then, and only then, he told us that the fee for the place was included in the cost of the bus fare. Oh, forgot to mention that part before, didn’t we buddy. I guess that’s what I was supposed to be doing while I walked around aimlessly. I think we were up there for a total of 2 hours or something. Only takes half an hour to an hour to see the scenery (Which was spectacular as always) (Brackets) but the other hour was a waste. We drove back and it was dark. Couldn’t see very much as it was overcast so no moonlight. When I got back to the hostel, I really didn’t have much to do. The town itself was a fair distance away and it was dark. It was about 4 in the afternoon so I just did stuff for a while, including eating dinner and went to bed around 11:00. Great work Jacob. Nice to read your stories again.